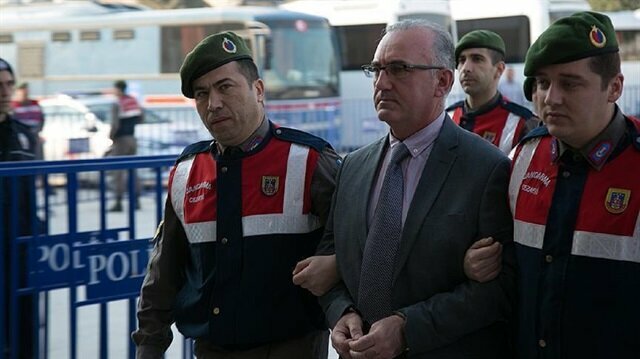 Two former Turkish army officers were given aggravated life sentences in southwestern Turkey on Tuesday for violating the Constitution during the 2016 defeated coup. Fetullah Terrorist Organization (FETÖ) and its U.S.-based leader Gulen organized the July 15, 2016 coup bid, which left 250 people martyred and nearly 2,200 others wounded. The 2nd Heavy Criminal Court in Denizli province convicted former Brig. Gen. Kamil Ozhan Ozbakir and ex-Col. Erol Akman, who were already in jail pending trial, for trying to overthrow the constitutional order through violence as part of the coup attempt. The court also handed down life sentences to four other former soldiers, including Ziver Inci, Oguz Ay, Muhammet Ekinci and Avsin Yapar for the same charge. In the case involving 64 defendants, 40 were jailed pending trial, and former soldier Tolga Kilincaslan was sentenced to one year and eight months in jail. The remaining 59 were released. Separately, in central Kayseri province, four FETÖ suspects were given jail terms ranging from three to seven-and-a-half years for being members of an armed terrorist organization. On Monday, a court in the southern province of Adana sent three terror suspects to jail for a period ranging between six and seven years for being FETÖ members. At least nine suspects were arrested in counter-terrorism operations across Turkey for their alleged links to FETÖ, the terrorist group behind the 2016 defeated coup attempt in Turkey, police sources said Tuesday. Turkish forces arrested eight in simultaneous raids early Tuesday in the Aksaray, Denizli, and Kocaeli provinces following a warrant for 13 suspects, said a police source, who asked not to be named due to restrictions on speaking to the media.A lawyer and a pharmacist were among the suspects, the source said, adding that efforts are ongoing to catch the remaining suspects.Separately, an on-duty lieutenant in the western Balikesir province was arrested under a warrant over his suspected phone calls with FETÖ terror group members, the governor's office said in a statement.The statement said that the officer had been contacted "consecutively" by public telephones.25 FETÖ suspects arrested across TurkeyAccording to the Turkish government, the Fetullah Terrorist Organization (FETÖ) and its U.S.-based leader Fetullah Gulen orchestrated the defeated coup on July 15, 2016, which left 250 people martyred and nearly 2,200 injured.Ankara also accuses FETÖ of being behind a long-running campaign to overthrow the state through the infiltration of Turkish institutions, particularly the military, police, and judiciary. In the northwestern province of Kocaeli, a court sentenced former police officer Firat Ozserdar to seven years and six months in prison for being a member of an armed terrorist group. Another court in the same province handed down six years’ jail time to a former engineer, who was already in jail pending trial. Murat Koyun was sentenced to six years in prison for being a FETÖ member. He denied all the charges including using ByLock -- an encrypted smartphone messaging app used by FETÖ members before and during the defeated coup attempt. In the Black Sea province of Rize, a court sentenced eight former police officers to more than seven years in prison while another FETÖ suspect was given three years and nine months’ jail time. They were all convicted of being members of an armed terrorist group.